Our grand #Austin2Boston road trip took us for the first time to Virginia and I couldn’t have been more surprised at how beautiful and lush the star of Virginia was. Personally, I was very excited to be spending the 4th of July weekend in such a historic state – and even more fun for us – at the BEACH. America’s birthday in Virginia Beach?? Could it get any better than that? YES! Hands-down, this was a highlight for us on our entire #Austin2Boston trip. All 4 of us were able to enjoy flying thru the trees at this “ariel forest park”. The Adventure Park contains 13 different trails made of zip lines, rope swings, platforms, bridges and tons of exciting challenges that are all up high in the trees. They have varying degrees of difficulty, so you can choose which type of “thrill” you’d like to experience. My 6 year old was a HUGE daredevil and wanted to try as many as he could. The rest of us tried as many as we could in the 3 hour window we had. 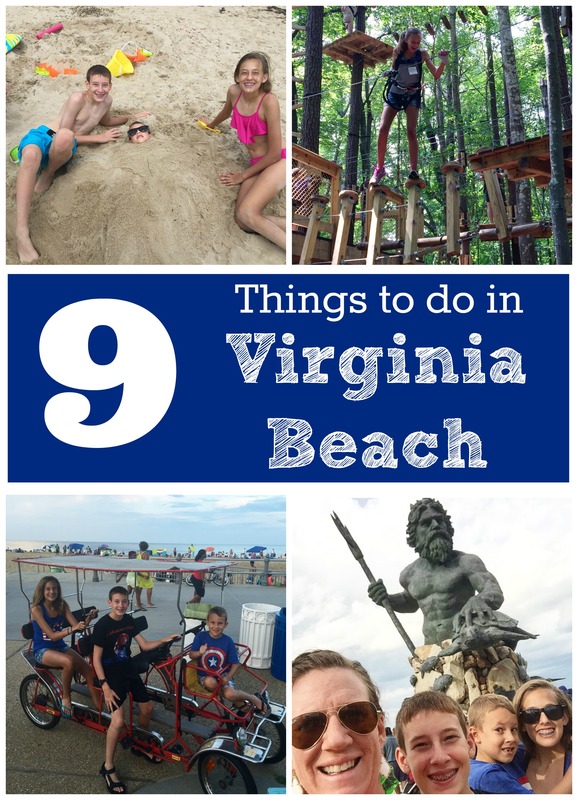 It’s a TON of fun and we recommend this to anyone visiting Virginia Beach. After all the physical activity in the Adventure Park, cool off with a stroll through the Virginia Aquarium. Home to harbor seals, tiger sharks, river otters, rays, and hundred of more sea animals, the aquarium also features hands-on exhibits. While we were visiting, the special exhibit, Dinosaurs! was available. And they also have a 6-story National Geographic 3D Movie Theater. Great for little ones in strollers or a rainy day experience. An absolute MUST if you are visiting Virginia Beach, you have to take a selfie with Neptune – but you may be waiting in line! We didn’t think we would enjoy riding a surrey up and down the Virginia Beach boardwalk as much as we did – and that is why it is making this list! We laughed the ENTIRE hour we rode it – I couldn’t tell you what was so funny at the time, but we really enjoyed riding it together. It’s inexpensive fun (around $20) and many shops will rent them to you by the hour. We did this after dinner around dusk so that it was a bit cooler and easier to manage. We are big geocachers and on our trip wanted to discover a few. So we took an hour to explore this beautiful state park that is also a historic site. The first English colonists landed here in 1607 and it moored British vessels during the War of 1812. It’s full of great trails to hike, bike and even ride segways on. And camping is available if you are into that – we are not…..
Another great piece of history, the Cape Henry Lighthouse is one of the oldest surviving lighthouses in the United States. It was built by George Washington (well, authorized to build) and overseen by Alexander Hamilton. If you are wanting to walk up to the top, make sure you visit during open hours and know that you are driving on an active duty military base – Fort Story. We couldn’t visit the Atlantic Coast for the first time and NOT have some seafood. We enjoyed dinner one night at Bubba’s Seafood Restaurant & Crabhouse. We were excited to try it as it was recently named one of the 21 Best Seafood Shacks in America. These Texan kids didn’t know what to expect but atleast 2 out of the 3 were adventurous and tried crab cakes, shrimp cocktail, crab legs, and red snapper. We sat on the porch overlooking the Chesapeake Bay and it was delightful – it was the perfect East Coast seafood dinner that I had been wanting. And of course we spent time on the beach – what most people who are visiting Virginia Beach are coming to do. During our time here, we stayed at the Virginia Beach Resort Hotel which was a great location and had a terrific beach that we walked down to each day. This hotel is not located in Virginia Beach along the boardwalk but on what is called the “Back Bay”, about a 10 minute drive. The hotel had nice & spacious rooms with a built in kitchen and the grocery store was right across the way, which made breakfast & lunches much more affordable. We walked right down to the beach on the 4th of July and rented 2 chairs and an umbrella for the day and literally sat there all day playing in the water. It was the perfect way to spend the holiday! There are many more fun things to do in Virginia Beach including mini golf, a water park, surfing lessons & sailboat excursions. Click here to learn more. Disclosure: My family & I were invited to visit Virginia Beach, VA and were provided with opportunities to enjoy the area. I was not compensated for this review. All opinions are my own. We visit family in Virginia Beach every year, but we have never been to the Adventure Park. I guess we’ll put that one on our list. Mostly we divide our time between First Landing and the beach. Norfolk is pretty fun too. One thing that interests me about my upcoming trip to Virginia is the seafood. I don’t live near any oceans and the seafood I try is never good! I will have to try out one of those restaurants you recommended! Thanks for the tip! All of these ideas are awesome! Seems like you have a pretty adventurous bunch on your hands!